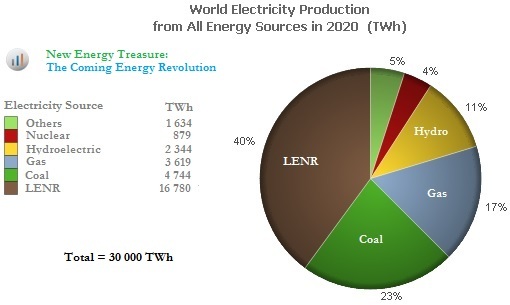 LENR & Worldwide Electricity Production, 2020! Below is an estimate of what worldwide electricity production might look like in 2020. Remember, just as Coal led to the industrial revolution and Electricity led to the technological revolution (Radio, TV, Telecoms, Computing, Internet, Smartphones), soon LENR (light) shall lead to whole new technologies the world has yet to even imagine or dream about. This entry was posted in Uncategorized and tagged Cold Fusion, electricity production, LENR, Light, Technological revolution. Bookmark the permalink. 1 Response to LENR & Worldwide Electricity Production, 2020!